The art of Haiti has a rhythmic, syncopated imagery that is informed by both the traditions of Carnival and Vodun. 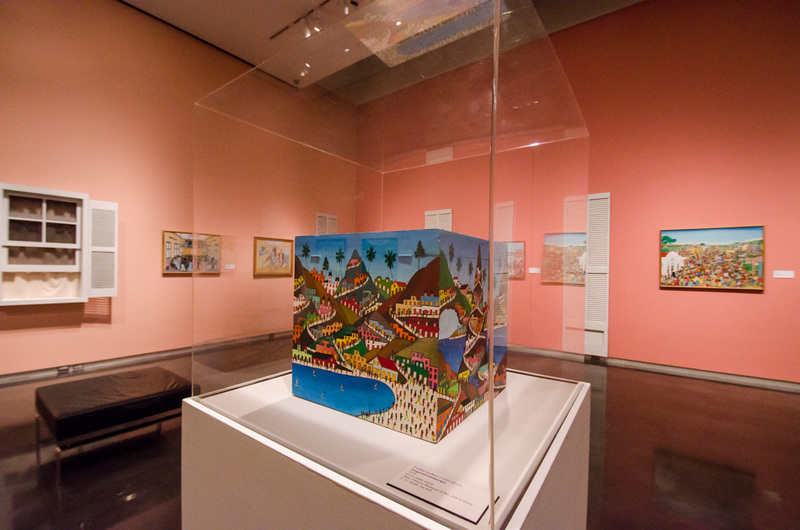 The exhibition, The Carnival, the City and the Sea looks at the collection of Perry Smith, who acquired over 80 works of art during his time as a Christian missionary to Haiti. 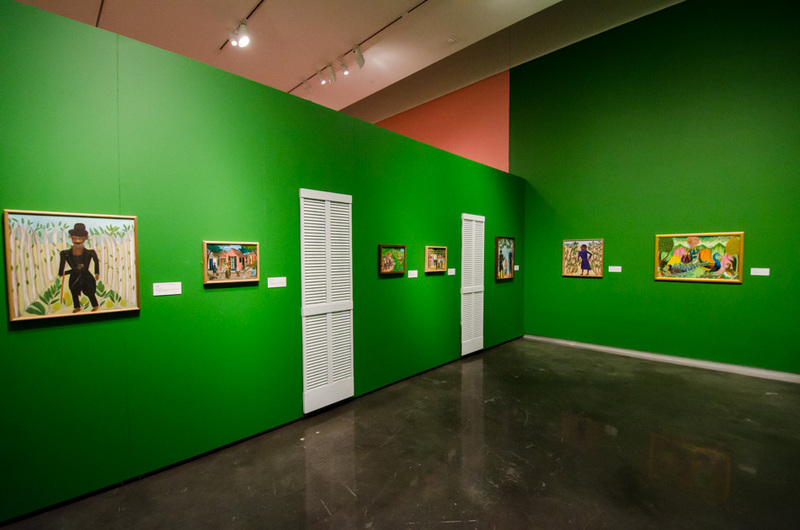 Housed in the collection archives of the New Orleans Museum of Art, the collection has been exhibited only once. 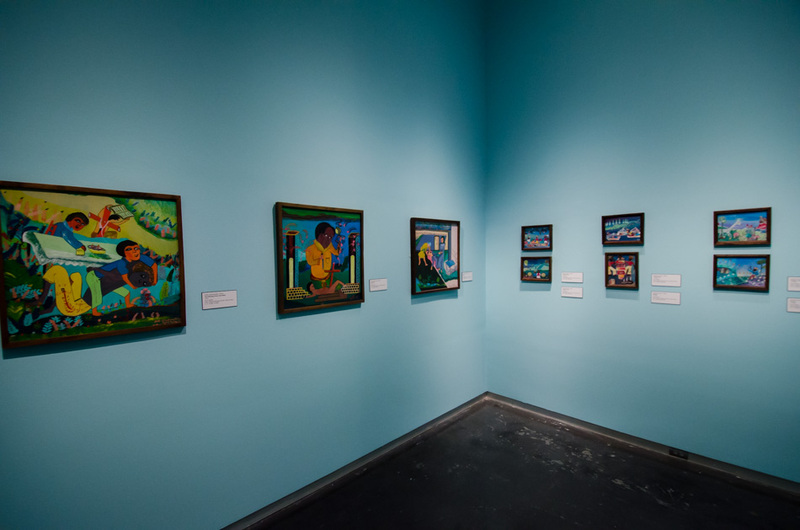 A connoisseur of Haitian art, Smith collected some of the most notable of the tradition, including first generation artists, Toussaint Auguste and Philome Obin. In the collection are also artists from the school of Obin such as Etienne Chavannes and Antoine, Seneque, and Telemaque Obin, as well as works of world- renowned Haitian artists such as Wilson Bigaud, Rigaud Benoit, and Gerard Valcin. The Carnival, the City and the Sea looks at three rhythms in Haitian life. Rara, as part of the Haitian Carnival is an annual festival that takes place over the Catholic Lent Season with many parades during the Easter week. The costumes and flags (drapos) displayed during Rara are elegantly adorned glistening beaded vests and banners, many eluding to the Haitian Loas or deities of Vodun. The bustling cities of Haiti provide the inspiration for the part of the exhibition entitled “The City,” which has become a place of commerce, a site for performance and a virtual crossroads of class, culture and Haitian hybridity. The last section of the exhibition is entitled “The Sea” and features works that look at the whimsical and intrinsic spiritual culture of Vodun in Haiti. Haitian Vodun is inextricably involved with the sea and all of its interconnected bodies of water as well as with the “bois” or Haitian jungle or forest. Within these elements, as with the mountains and the sky, the Loa, or Haitian deities are found. But it is the sea which is the starting point, the clear viscous line that separates the living and the dead. The sea was the site of the middle passage and holds the bodies of the African ancestors that did not make it through that voyage alive. The sea is also the realm of many important Loa and therefore it becomes a primordial and diasporic liminal site, haunted and ghostly, life-giving and affirming. Imagined interactions between these three systems, and the unpredictable outcomes of such encounters, provide a point-of- departure for this amazing collection of Haitian Art. 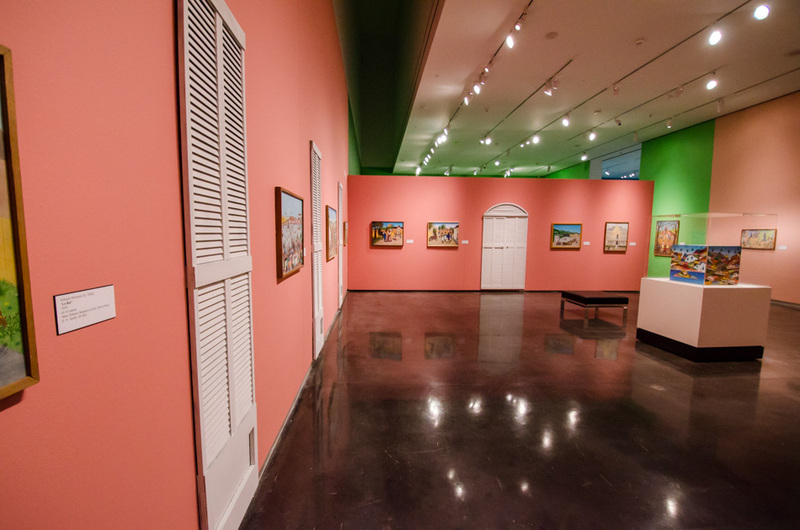 The exhibition encompasses a chronological look at the traditional Haitian school as well as touching upon the three vital elements within Haitian culture. Exhibited here are paintings, metalwork and papier-mache sculptures as well as elaborately painted screens and marvelous architectural cubes of breathtaking flora and fantastic cities. All of these works function as hybrids, borrowing freely from a wide range of existing patterns that exist within the magical and yet deeply scarred landscape of Haiti. Vibrant colors of dragonfruit pinks, melon greens and sparkling teals are the choices for the wall colors and serve as a way to seduce the viewer with an invitation to embrace the playfulness and joyous spirituality of the Haitian experience. Beauty and whimsy become catalysts for creative energies in a world that explodes, disintegrates, and morphs into new forms on a daily basis. The exhibition is ultimately about the artistic possibilities that are a result of Haiti’s relationship with a landscape and a history that is increasingly complex and multi-layered. This exhibition is made possible in part by a Local Project Asisstance Grant from the Arts Council of Greater Baton Rouge, funded by the East Baton Rouge Parish Mayor-President and Metro Council. Learn about the music and art of Haiti as Dee Hatch of Culture Canvas leads the group in painting your very own Mardi Gras-themed painting. Bring your own food/drink for an entertaining afternoon! Spots limited to 20. Pre-registration is required.